Anna Wintour just revealed the shoes that everyone wanted at Milan Fashion Week, and it's not what you'd expect. In fact, it wasn't really a shoe at all, but rather a slipper. We're used to seeing strange shoe trends emerge, but we have to say we definitely didn't see this one coming. In a video for Vogue, Wintour discussed all things Milan Fashion Week and the shoes she loved the most, as well as the trends she spotted. Speaking about the Dolce & Gabbana show, Wintour said she found it "charming and full of ideas that pushed the envelope." But that wasn't all. She also revealed the shoe everyone, including herself, wanted following the D&G show. 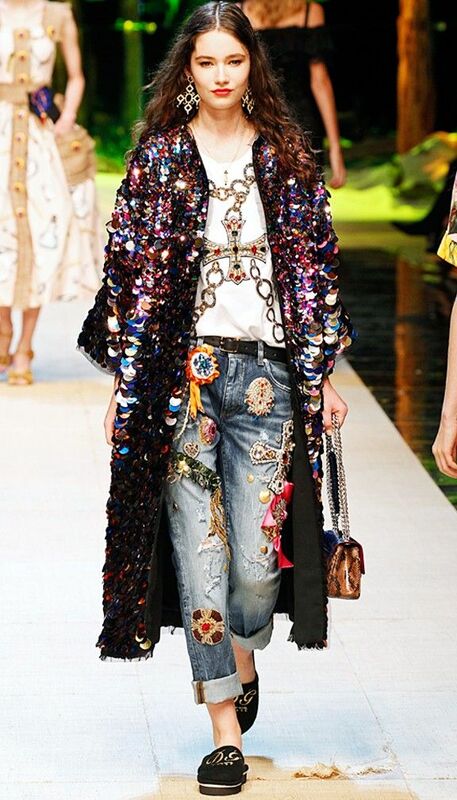 "My very very favourite piece was they took the traditional hotel slipper and Dolce & Gabbana’d it. That was the one item I noticed that every single model there wanted and I certainly wanted. I love their appropriation of very normal pieces of clothing and giving it the Dolce twist." And after seeing the shoe in question, we have to agree. Not only do they look comfy, they're a sophisticated, elevated version of the slider, so it makes total sense. Keep scrolling to watch the video and see the piece she's talking about. The slippers on the catwalk. We can just imagine how comfy these will be come next season. A close-up of a pair of the slippers. While you can't shop these yet, you can buy other Dolce & Gabbana shoes over here. That gives you just enough time to decide how you're going to wear aforementioned slippers though, right? Next up! Check out these 17 pairs of flat shoes for girls who can't get enough of them.